As late as 1913, Texas had only four major reservoirs with a total storage capacity of 288,340 acre-feet. By January 2012, Texas had 188 major reservoirs (those with a normal capacity of 5,000 acre-feet or larger), not counting four that are normally dry and six reservoirs made up of proximate impoundments. According to the U.S. Statistical Abstract of 2010, Texas has 5,607 square miles of inland water, ranking it first in the 48 contiguous states, followed by Florida, with 5,373 sq. mi. ; Minnesota, 4,782; and Louisiana, 4,433. There are about 6,976 reservoirs in Texas with a normal storage capacity of 10 acre-feet or larger. Reserviors having more than 5,000 acre-feet capacity are listed below. Date refers to the year that impoundment of water began. Multiple years refer to later, larger dams. Reservoirs normally dry are in italics. Storage capacity and surface-area calculations are for conservation elevation. Because sediment deposition constantly reduces reservoir volumes over time, these are figures from the most recent surveys available. An acre-foot is the amount of water necessary to cover an acre with water one foot deep. 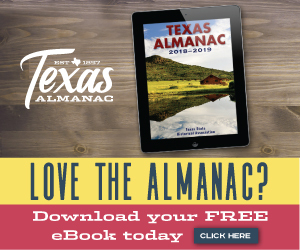 Sources: U.S. Geological Survey, Texas Water Development Board, the Handbook of Texas, Texas Parks & Wildlife, U.S. Army Corps of Engineers, previous Texas Almanacs, various river basin authorities, website of the owners of reservoirs.